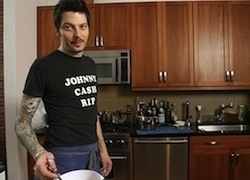 Speaking of star chefs with online programs and cable television networks picking up web series, here’s a piece of relevant news that missed our radar: IFC acquired digital media studio ON Networks‘ indie cooking show, Dinner with the Band. 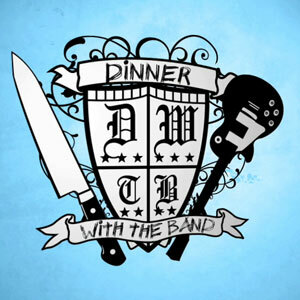 Originally conceived by Food Channel veteran Darin Bresnitz and produced by Finger on the Pulse, Dinner with the Band first premiered online way back in March 2007. The show became an instant favorite amongst tattooed gastronomes with an internet connection and an affinity for indie rock. In each episode, the edgy Sam Mason (who has made pastries at New York’s WD-50, now runs a restaurant called Tailor, and is edgy both in terms of his appearance and culinary style) invites a band to his kitchen/concert studio space to sing for their supper. That means Mason makes dishes like avocado margaritas or mackerel-grapefruit ceviche with acts like Ontario’s Tokyo Police Club and New York’s Holy Hail, then watches them rock out. I would tell you to give it a look, but it appears that since the acquisition, ON Networks has removed all Dinner with the Band episodes from its website. To see the program, you’ll have to tune into the television premier at 11PM EST on November 24. IFC is set to air a total of six 30-minute episodes as part of the network’s Automat programming block. The episode line-up includes appearances from Les Savy Fav, Kid Sister and Flosstradamus, MEN, Final Fantasy, YACHT, and Sharon Jones & The Dap-Kings. I hope your palates and eardrums are appropriately whetted and/or satisfied.